The forms below are forms that are available in PDF format. You need to have Adobe Acrobat Reader installed on your computer to view these forms. Professionals, you are free to share any of these forms with clients provided they are not altered. 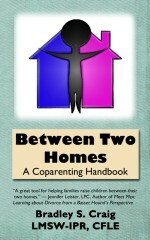 Cooperative Coparenting vs. Parallel Parenting - Comparison of two forms of raising children between two homes to protect children from conflicted parenting. Click here for our professional seminars. If you do not have Adobe Acrobat Reader, you can download it FREE OF CHARGE by clicking on the Adobe icon.